The Bermuda Underwater Exploration Institute [BUEI] and Gass Productions will present episode one of the “Ocean Vet” series at the BUEI Talks series on September 16. 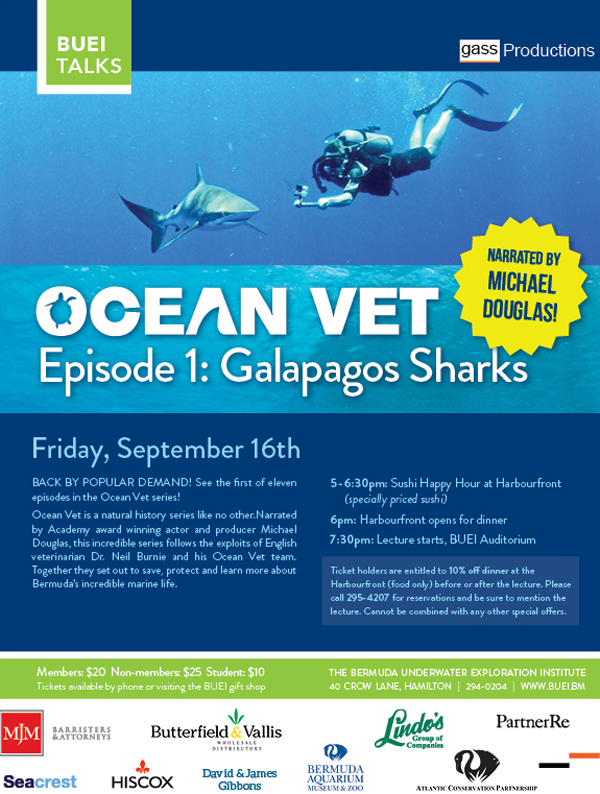 The screening of the episode – titled “Galapagos Sharks” and narrated by actor Michael Douglas – will be held at 7.30pm on each evening. Along with the screenings, a Sushi Happy Hour will be held at Harbourfront from 5.00pm to 6.30pm, with dinner opening at 6.00pm. Tickets cost $20 for members, $25 for non-members and $10 for student, and are available by calling 294-0204 or visiting BUEI’s Oceans Gift Shop.